People in Boston love celebrating St. Patrick’s Day. It’s all about wearing green, drinking, and going to parades, and in my book that’s a pretty good holiday. Let’s face it, it’s pretty much just a giant drinking “holiday” but if you’re going to be spending the day drinking in a bunch of Boston bars, you might as well be drinking for a good cause. We like to attend an annual St. Patrick’s day pub crawl in Southie that goes by the name Tipsy for Tatas; it raises money for breast cancer. I love a cause that lets me start drinking at 9am and walk bar to bar, and even better when it’s related to the best drinking holiday. I’ve learned that cupcakes are a great way to make friends. I mean, who doesn’t like to bond over a sugary, cakey, deliciousness? 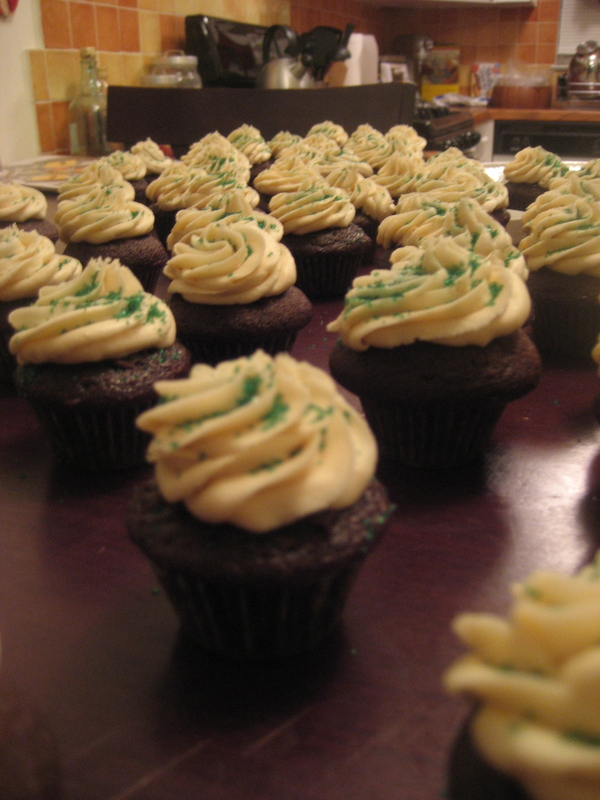 The Tipsy for Tatas pub crawl would be a perfect time to test out the best St. Paddy’s day cupcakes ever…Irish Car Bomb cupcakes. Ah, the Irish Car Bomb! If you’ve never had one (which I can’t believe), you have a3/4 of pint of Guinness the you drop a shot glass in filled with 1/2 Irish whiskey and 1/2 Bailey’s. Chug as fast as you can before the mixture curdles. I know this sounds absolutely disgusting, and it kind of is gross but boy does it make a good cupcake. I followed the recipe above and made them into mini cupcakes, the recipe says it makes about 40-48 minis but I got closer to 60. Let me tell you that carrying around cupcakes on a St. Paddy’s day pub crawl will make you instantly popular. People seriously loved these things and they tasted just like a Irish Car Bomb but so much better because they were deliciously sweet. 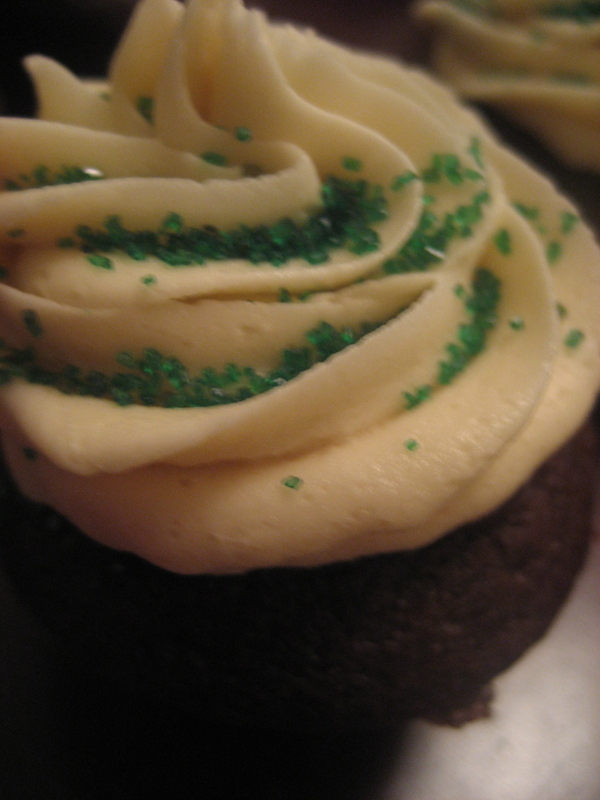 The Guinness cake stayed really moist and delicious and when you bit into it, the Jameson ganache made it perfect. The only issue with the filling is that I had to cut a little cork out of each and every mini cupcake to be able to fill them. This was pretty tedious and time consuming but left me with 60 cupcake corks which were perfect leftovers to dip in the extra Bailey’s frosting and chocolate ganache. To make them extra festive, the green sprinkles were put on by my special little helper friend Pando. This was her first (but not last) time helping me with cupcakes and her baby fingers did such a good job. I know these were a hit, but I’m told that they do not taste good the next morning when you’ve had too many actual Irish Car Bombs the night before. Thankfully I don’t have experience with this so I’ll just have to take other’s word for it. Regardless, it was a fun cupcake adventure!